Every day I make a 6-cup pot and drink about half of that. Even though my commute to work is only 20 feet from the kitchen, I still get lazy and miss refilling my cup before it is too late. So much for Always fresh! I buy good coffee but it tastes bad. Mike does not drink coffee so the 12-cup machine is a tad excessive, especially when counter real estate is crucial. Like when cameras switched from film to digital, I was hesitant to get on board… this is how I relate to the single-serve coffee makers. Keurig… I’m looking at you! 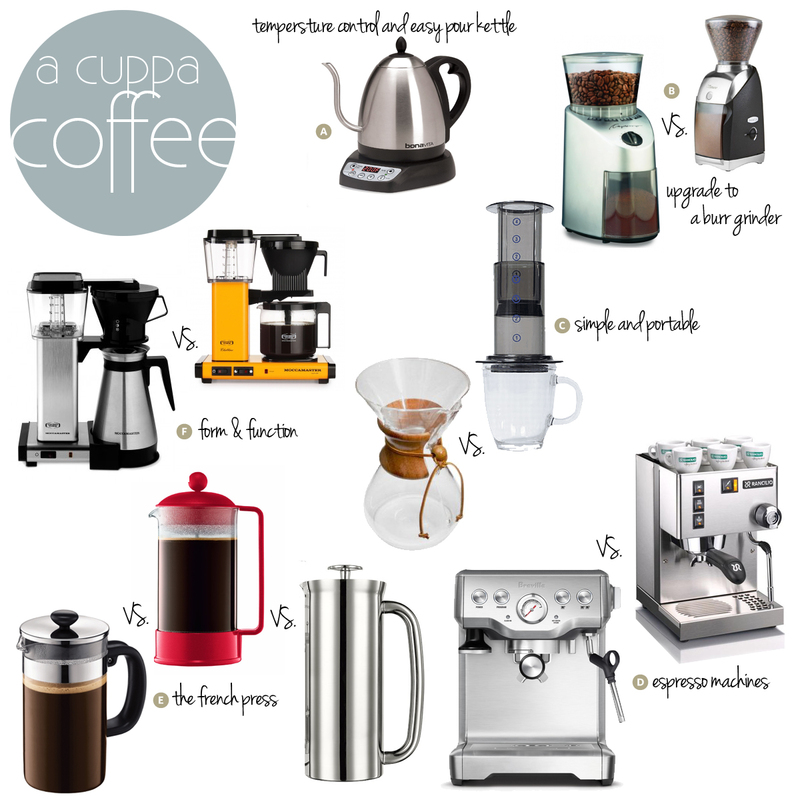 So with all of this in mind… Do I continue with the drip or do I go with a French Press? Do I invest in a fancy espresso machine or do I jump on Chemex-train? What to do, what to do? I started by googling my thoughts and concerns and happily landed on a great website: \seattlecoffeegear.com. They have all the answers in Youtube format and I am officially addicted and can’t stop watching. C. Both the Aeropress (~$35) and the Chemex (~$42 for a 6-cup) are affordable and have great reviews. If I am investing in a kettle and grinder this may be a good option but I am leaning towards the Chemex because I can bring it upstairs and refill my mug rather than making one cup at a time with the Aeropress. But, the Aeropress is great for travelling and especially camping… good to know. F. The Technivorms rate well for drip coffee brewers and, the glass (~$440) did better than the therrmos jug (~$330) on the hour-later taste-test. So what does this all mean? I am not sure yet, maybe more Youtube videos? I am going to move forward with the kettle and grinder upgrade. Both my current kettle and the grinder are very old so I do not feel guilty about donating them. As much as I love the look of the Technivorms, I am not interested in spending that much money on another drip machine. And as much as I love the thought of making espressos at home, I am not ready to invest in one of these, nor do I want to cheap out. I own a single cup Bodum, and like it, but I find the coffee strong and hated cleaning it. I like the fact that the Espro Press claims to be “grit free press coffee” plus it is Gail’s favourite! Thanks for the insight – good to know about that machine. I agree fully with the bodum comments – and even read that the others don’t give you the same taste (acid). you should check out Gails videos! Lots of great reviews. I’de like to way in on this if I may, as I have a similar situation. AK doesn’t drink coffee, and I usually just have coffee at my desk, once I get to the office. I find Bodeums much harder on my stomach, and it’s because they don’t filter out those acid/oils that you see the top of your cup. I did the old paper filter, into a single mug for awhile, but to be honest – it was crappy. I HATE Keurig the way I hate a swiffer – taking a simple invention, and changing it so it creates tons of garbage, is not progress. Then a co-worker brought in a super cheap, and simple expresso machine. It’s digital, and probably from canadian tire, or Walmart or something. I just press the manual button it makes a nice long americano – aka a decent cup of coffee with nice froth on top. I can add more or less coffee or water, to really fine tune it. It takes up about as much room as the old perk machine does and only makes a cup at a time, but I’m the only one who drinks it, and it’s there and fast any time I want another. I use the stovetop at home on the weekends… but I kind of miss the expresso machine at work.